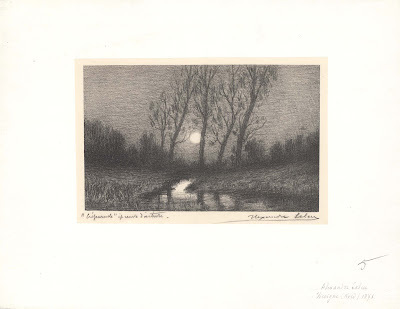 “Crépuscule” (twilight), c1925 based on a similar lithograph with the same title by Lelue; see: https://www.ebay.fr/itm/Dessin-lithographie-alexandre-leleu-/142655988187?hash=item2136f5a1db (note that this is an auction site and so the link is temporary). Lithograph on cream chine-collé on heavy wove paper with wide margins lined with a support sheet, signed by the artist and inscribed that it is an artist’s proof (preuve d'artiste). Lifetime, artist’s proof (i.e. an impression taken before the edition). Condition: a faultless hand-signed impression in near pristine condition (i.e. there are no tears, holes, folds, abrasions, stains or foxing). I am selling this exceptionally romantic lithograph steeped in the quietly poetic mood of early evening for AU$97 (currently US$77.74/EUR63.43/GBP56.08 at the time of posting this listing). Postage for this print is extra and will be the actual/true cost. 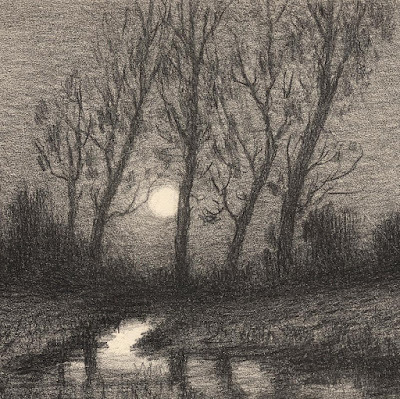 If you are interested in purchasing this twilight scene in its proof state, hand-signed by the artist, please contact me (oz_jim@printsandprinciples.com) and I will send you a PayPal invoice to make the payment easy. 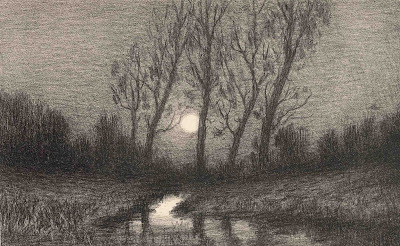 I can see Lelue’s point to choose lithography as his graphic medium for this particular image as it projects an almost tactile graininess to the portrayed scene of twilight. 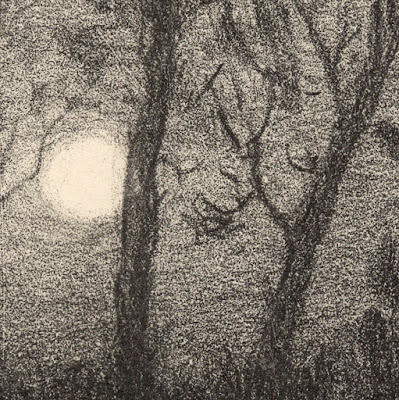 If Leleu had chosen etching as his medium, he would have no doubt succeeded in capturing the phenomenon of fading light, but I envisage that the outcome may have expressed complex mystery and secretive life in the shadows resulting from a layering of etched line necessary to achieve deep blacks. With lithography, however, the “mystery” evoked by the depth of layered etched lines in shadow is replaced with a gauze-like translucence that keeps the mind from penetrating the surface effect. In short, I believe that Lelue wanted the viewer to experience feelings that could best be described as a screen of melancholy: a feeling of hushed quiet where horizontal and vertical strokes connote a solemn mood.